Microsoft Corp's new Surface device signals the software company's hunger to join the three-way battle for the tablet market with Apple Inc and Google Inc, even if its longstanding hardware partners are not quite ready. The company's unprecedented move into PC design was a slap for traditional PC makers - which have fallen behind Apple in creating attractive machines that blend smoothly with software - but may primarily be a wake-up call for its partners rather than a long-term attempt to compete. "It's their model to show what can be achieved and lead the way and let the others ultimately participate," said Josh Olson, technology analyst for Edward Jones. With Apple setting the pace with its slick devices, it was more risky for Microsoft to leave hardware development purely to the laggard computer makers, said Sid Parakh, an analyst at fund firm McAdams Wright Ragen. 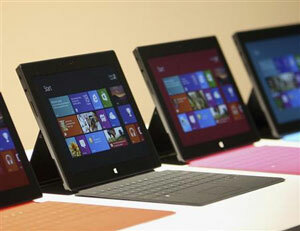 "Microsoft is building options," said Parakh. "They are saying 'Here's what we really want the hardware to look like to make it successful.' It's basically an experiment to see if they can push the ecosystem." The shares of the world's largest software company jumped almost 3 percent as Wall Street and investors welcomed Microsoft's move. Analysts praised the snappy hardware and revolutionary keyboards but questioned the lack of enthusiasm among developers for creating applications that run on the new Windows 8 operating system and the absence of hard details on pricing and availability. "Though pricing details are unclear ... Microsoft will need to significantly undercut the iPad to be competitive," Jefferies analyst Peter Misek said. The Surface tablets - announced at a much-hyped event in Los Angeles on Monday - will come in two versions, one running Windows RT, based on the same ARM Holdings chip designs that power most tablets, and a higher-performance version running the full Windows 8 Pro operating system that is designed to compete with lightweight laptops. No firm ship date was set for either. "The most important factor in the success of a tablet is its ecosystem. Based on our discussions with developers, we find the lack of enthusiasm concerning," Misek said. Analysts expect the slimmer Windows 8 tablet to struggle to compete with the iPad, which offers more than 225,000 apps, and to a lesser extent with Google Inc's Android-based tablets, such as Samsung Galaxy Tab. Google, which recently bought hardware maker Motorola, is also readying its own tablet, a source familiar with the company's plans said. It is inevitable that Microsoft will upset hardware partners such as Samsung and Hewlett-Packard Co with its well-guarded move, said Olson, but that would likely not cause a long-term rift. "They (PC makers) might bristle but ultimately they will have to work with Microsoft," he said. "They will continue to be the leading operating system maker for both enterprises and consumers. It's the nature of the beast." Microsoft said it would only sell its devices in its 25 stores in the United States and through its online store, suggesting it does not plan to go head-to-head with other manufacturers' products at Best Buy and other stores. Microsoft excited industry watchers with the look of its new machines, but said little about content. The company made no mention of its Xbox game and video console, which Microsoft is trying to make the center of its entertainment offerings. "This is a great opportunity to leverage what is clearly a very loyal and established installed base and begin to migrate those consumers over to other Microsoft hardware devices while still keeping them within the Xbox live ecosystem," said Jesse Divnich, consultant and analyst at research firm EEDAR. Microsoft also said nothing about its Skype video calling service or recent tie-up with Barnes & Noble Inc's Nook unit, but analysts expect the Surface to feature both. "All of that is coming," said Parakh. "I would be very surprised if none of these things were on the devices. They are just natural fits." The most striking feature of the new devices was a keyboard that doubles as the tablet cover. "The keyboard, a simple accessory, is what makes the device most compelling, as it preserves traditional interface that we believe many users appreciate (and will demand) with the subtlety of a cover, something most users will want anyway," said Citi analyst Walter Pritchard. Morgan Stanley's Adam Holt said the cover keyboard, compatibility with Microsoft Office, integrated USB ports and features optimized for Skype would help Microsoft differentiate itself from other tablet makers. But selling two versions will confuse consumers, said analysts at Jefferies, Forrester Research and ThinkEquity. "Choice is a key tenet of Windows, but too much choice is overwhelming for consumers," Forrester Research said. "Apple gets this, and limits iPad options to connectivity, storage, and black ... or white." Microsoft shares ended up 2.9 percent at $30.70 on Nasdaq.